To make any sort of living as a freelance musician, you must live in or near an urban area. That situation makes it hard for percussionists to practice once we are out of school, since it is difficult to find a space that can handle the amount of instruments we have or the noise they make. I recently moved to Western Avenue Lofts in Lowell MA from a small one bedroom unit in Jamaica Plain, more than doubling my living space in the process while decreasing my rent. 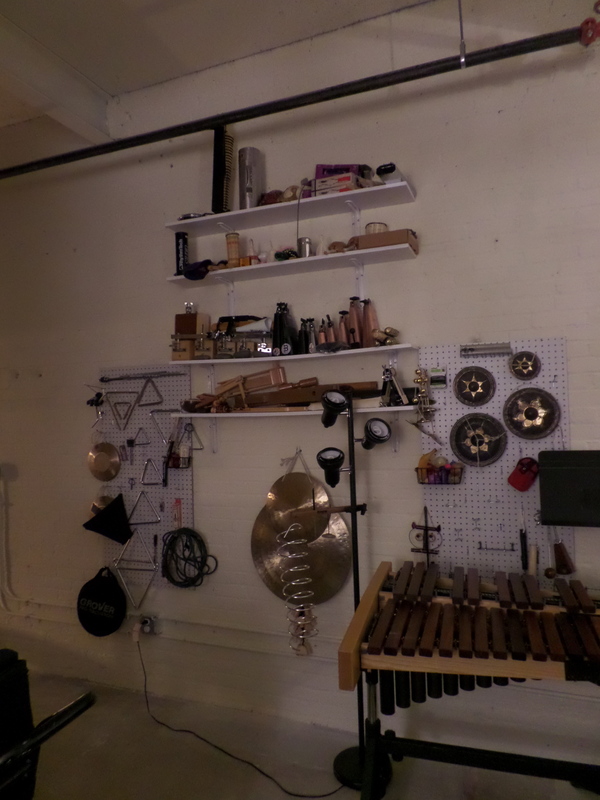 In my old place, I had no room for my instrument collection, and for four years slept on a makeshift bed in the living room with timpani and bass drums towering over me. Now, I have ample space to live comfortably while having my instruments set up. As I turn my head to the left from my office corner I’m looking at three cimbaloms, a five octave marimba, four timps, a keyboard, and a xylophone. It is a great situation. Even now with the space issue solved, there is still the noise issue. I although I live in an incredibly welcoming community of artists, I’d have run out of goodwill on day one if I played an acoustic drum set at full volume in my loft. So, I spent several months in 2013 researching electronic drum sets. It is not a welcoming market. There is not a lot of middle ground between e-drums that look like toys and $7,500 top of the line Rolands. If you have the money to burn, buy the high end V-drums by all means. They are miles above the rest. I do ok, but I’m not about to spend that kind of dough on electronic drums. I eventually settled on the Alesis DMX premium six piece kit. The biggest problem with most electronics kits is the size of the pads. I prefer to play on four piece kits, so if I’m using a smaller kit I would have a 13″ snare, 10″ tom, 14″ floor tom, and an 18″ bass drum. A lot of cheap E-drums have 8″ pads for everything. It just doesn’t feel like playing on a real drum set. 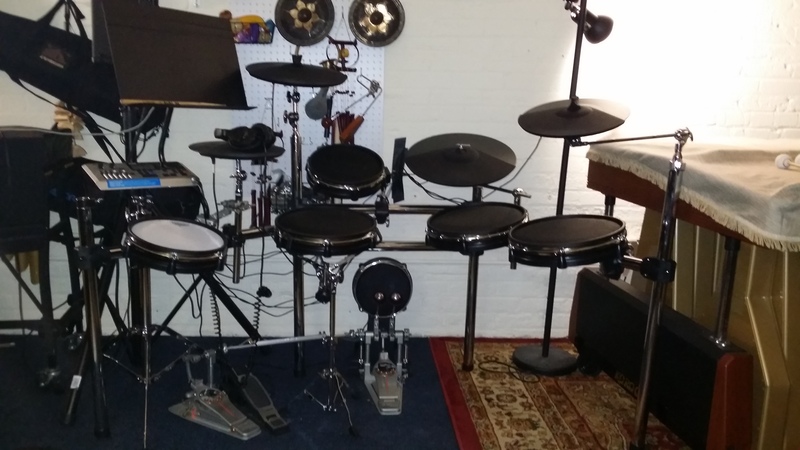 The Alesis DMX comes close with a 12″ snare, 10″ tom, and 12″ floor tom. The size of the bass drum pad doesn’t matter for spacing, and this kit came with a couple toms that I don’t really need but am happy to use. I bought it on Amazon last year when they were offering a $300 rebate, so all in this kit was under $1,000. Not bad. They aren’t offering the rebate now in February 2014, but maybe they’ll do it again in the holiday season. You’ll notice in the stock photo of the kit, it is arranged in a 5 piece configuration with an extra floor tom. The rack is customizable with a little creativity, and I was able to turn it in to a four piece with an extra floor tom and an auxiliary pad on the left. Why people want a medium tom where the ride cymbal should go, I’ll never know. Another great thing about having these electronic drums at the ready is that they helped me overcome a rather pesky bout of tennis elbow. In March 2013 I moved heavy gear every day for several weeks, and as a result my left elbow became fairly useless for the better part of 10 months. I didn’t play an instrument outside of rehearsals and performances for that period of time if I could avoid it. With a steady regiment of rest and enough anti-inflammatories to kill an elephant, I no longer wake up with crippling pain in my elbow, but after that period of time my chops definitely suffered a bit. Getting these electronic drums and just sort of jamming on them with varying degrees of intensity got me back in to shape pretty quickly. But perhaps the greatest thing about practicing on electronic drums is the complete inhibition it allows. I have a cheap PA plugged in to the kit, but I mostly just hear them through headphones with no external amplification. When I lived in JP, I practiced in a complete dump in South Boston: a building filled with burn out rock star wannabes that were barely toilet trained, but I could make all the noise I wanted to without complaint. I practiced drum set a lot in that building. But I did so with the knowledge that other people could hear what I was doing, and one way or another that changed how I played. When I play electronic drums in my loft, absolutely no one can hear me. It gives me the freedom to be experimental, to try things out, to make mistakes, to fail miserably, and as a result, to get better. This entry was posted in electronic drums, electronic music, Percussion on February 12, 2014 by tolleism.